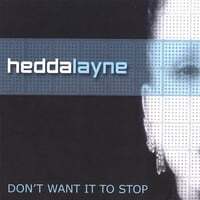 Hedda Layne releases her hot dance single, Don't Want It To Stop, mixed by producer Troy Lee Warden. These concepts are what drives Hedda Layne, her music, her life. Hedda Layne's musical journey has produced legions of loyal followers - fans of her music and fanatics of her electrifying performances. Hedda's voice and overwhelming stage presence are what captivates her audiences. Hedda Layne follows up last year's release of Feel The Love (remixed by Tracy Young) with Don't Want It To Stop, an energetic and provocative dance track for the masses. This maxi-single features a vocal mix, a chill out dub mix and an ultra-hot electro mix. DJ's and dance fans alike will love, love, love this track!